This Saturday night live on Sky Sports Box Office from Wembley Stadium in London, England, Anthony Joshua defends his titles against mandatory challenger Alexander Povetkin. The stakes are high always, especially at heavyweight, in the sport of boxing it only takes one punch to change the trajectory of a career. Will the ruling U.K. king keep his crown or will an eastern outsider upset the applecart? The full card can be seen in the United States on the new DAZN streaming service. Anthony Joshua returns to the scene of the crime at Wembley Stadium just 10 miles away from his old stopping grounds. Wembley Stadium will be rocking and rolling with a crowd estimated to be around 75,000-80,000 adoring fans. In April of 2017, Anthony Joshua and Wladimir Klitschko gave boxing fans across world one of the best heavyweight championship fights in well over a decade. Both men would kiss the canvas but it was Anthony who shifted the momentum stopping Klitschko late. The dust settled quickly from that legendary tussle and the pressure seems to have sunk in. In his last two outings Joshua’s offensive skills and overall power aren’t clicking in unison. It could be the fact he faced two boxers that moved on the outside more then most of his prior opponents. It also could be Joshua’s attempt to fix a few flaws in order to fight smarter and maintain his stamina as well. His body seems to have changed a bit, down from the 254 pounds he weighed for Wlad & Takam, tipping the scales at 242 for his unification bout with Joseph Parker in March. Joshua claims a mid-life crisis could be taking hold according to his quotes in the independent.co.uk. Whether it’s a different mindset or him staying in better shape between training camps, it’s clear to see something a bit off with Joshua. Time will tell if the pressure to fight Deontay Wilder is bothering him or motivating him. The jury is still out on Alexander Povetkin to an extent due to failing PED drug tests in back to back fights in 2016. It’s not that we don’t know about Povetkin’s amateur career or his unbeaten streak as a pro before getting stopped by Wladimir Klitscho in 2013. It’s really about his age(39) and what he has left in his current state in 2018. As a prosperous talent climbing the ladder at heavyweight Povetkin’s body was usually husky, carrying extra unneeded weight on his compact frame. After failing to outdo Wlad, it was easy to see the improvements Alexander had made to his physique. Failing two VADA drug tests and now being tested more often makes it very difficult to know which Povetkin will step in to the ring. As far as breaking this matchup down from an X’s and O’s perspective it seems fairly basic. 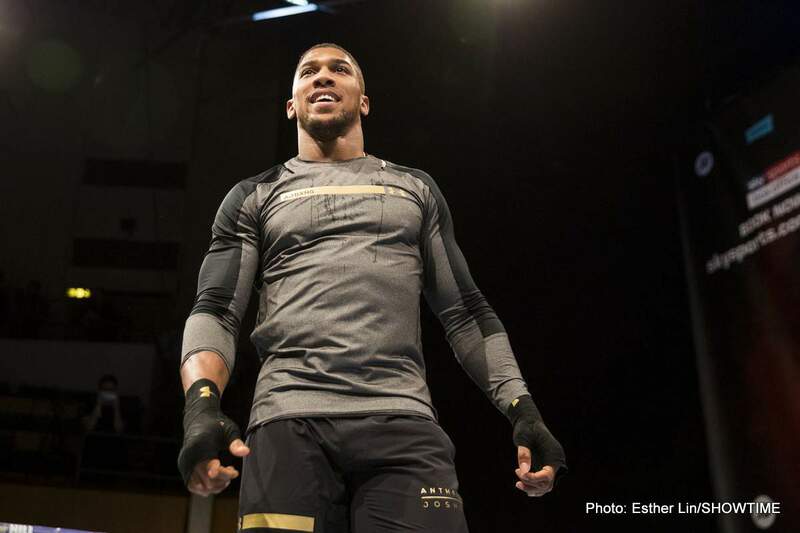 Anthony Joshua will apply a sturdy jab as he measures his way in to position to land power shots. Straight rights, upper cuts, and hooks to the body and head should soon follow his jab once the action heats up. The way this hack-of-a-scribe sees it, Povetkin has three options to choose from, the first is to stay on the outside. The second option is to close the distance, taking away opportunities from Joshua to catch Povetkin at the end of a fully-extended punch. The third would be to blend both options in order to keep Joshua off guard. It would be smart to begin the fight using the whole ring to laterally move and only attack in spots. Not allowing Joshua to set up shop offensively will prevent Anthony from being able put full force on each punch. Alexander can’t spend much time if any lying on the ropes in a high guard. Somewhere down the line Povetkin has to bring the fight to the champion. If he can close the gap and make Joshua uncomfortable, this fight could become very competitive. If Povetkin can faint enough to contain AJ’s jab and power punches, he very well could put a dent into Joshua’s armor. Povetkin does a good job of ducking under punches to get inside. Once closer, Povetkin is fully capable of landing short punches to the body. He’s crafty with his overhand rights and left hooks on the way inside as well. If Povetkin makes it a rough and tumble affair he could shock the world. A world by the way, that has completely discounted Povetkin instead focused on a date with Deontay Wilder. The problem for Povetkin using a throwback style on Joshua’s turf is the referee. There’s a slim chance the ref will allow Povetkin to be dirty and rough Joshua up. That fact, combined with a smarter more methodical approach from AJ will find him in far less exchanges as we’ve seen in the past. Beyond a few early rounds or hairy moments inside of a round, look for Joshua to time Povetkin as he loads up on heavy shots by the midpoint. A technical-stoppage is very possible whether just or not, but Povetkin has heart and is heavy-handed enough to see the final bell. My Official Prediction is Anthony Joshua by Unanimous Decision. Side Note: On Friday night before the return of ShoBox: The Next Generation, keep an eye out for a new documentary on Showtime called Cradle of Champions.